🎧 We are reviewing the Kingston HyperX Cloud II, an award-winning gaming headset with a plethora of useful accessories. The Kingston HyperX Cloud II features very large dynamic drivers (to be more precise, 53 mm in diameter), an over-ear closed-back design, virtual 7.1 surround sound, replaceable earpads, detachable microphone and solid construction. The Kingston HyperX Cloud II were designed in Sweden and offer a durability level that feels excellent with their aluminum frame and tough general constructive quality. The cups have an oval shape with leatherette pads and an additional pair of velour earpads; beneath the headband’s leatherette and earpads Kingston has placed memory foam cushions to provide an elevated level of comfort. Moreover, the cups are constructed in robust rubberized plastics that give a very pleasant feel to the touch and have metal plates on the back of them with the characteristic “HX” (HyperX) imprinted. Kingston’s decision to allow the removal of the microphone is a wonderful additional feature which allows you to use them as a “normal” headphone for music listening without having the protruding mic on one side. Kingston has well-thought the design of the detachable microphone; beside being easily removable, the 3.5 mm female connector for the mic can be covered with a rubberized piece that snaps on the connector section perfectly masking it, you can even hardly tell that they are gaming headphones when you cover the “hole”. This is not always available with gaming headsets which, instead, usually are designed with fixed/non-detachable microphones (for example, the Sennheiser Game One and Sennheiser Game Zero ). To answer any gamer’s compatibility doubts, Kingston explicitly informs that the Kingston HyperX Cloud II is compatible with PC, XBOX One , PS4 , Wii U , Mac , Android devices, iOS devices and Virtual Reality. Gamers will also be glad to know that the Kingston HyperX Cloud II is Xbox Licensed (tested and approved by Microsoft ), TeamSpeak certified, DISCORD certified and also fully compatible with Skype, Ventrilo, Mumble and RaidCall. Wide compatibility: PC, XBOX One , PS4 , Wii U , Mac , Android devices, iOS devices and Virtual Reality. Skype, Ventrilo, Mumble and RaidCall. Illuminated Audio Control Box / Remote – the module will light up the HyperX imprint to confirm that it is correctly connected and powered by the USB port, also the 7.1 middle button will light red when it is turned on. You will notice that the control has 2 buttons labeled “+” but you will also notice that each one is placed below a headphone icon or a microphone icon. The “+” button placed below the headphone icon will set the audio volume higher, the other “+” button will increase the input level of the microphone. Exactly like the “+” button, the “-” button can be found twice. The one below the headphone icon decreases the output volume and the other “-” button reduces the input of the microphone. The switch placed on the side of the Audio Control Box allows a fast and easy way to mute / un-mute the microphone. This Advanced Audio Box Control has a clip on the back to secure it to your trousers, belt, etc. Kingston HyperX Cloud II weight in Ounces and Kingston HyperX Cloud II weight in grams. The Kingston HyperX Cloud II unboxing results in a large amount of accessories: the Advanced Audio Control Box (with an USB DSP sound card built-in), a pair of leatherette earpads (this pair comes already placed on the cups), a pair of velour earpads, a detachable microphone with a windscreen, a mesh carrying bag and a flight adapter. This gaming headset comes carefully packed inside a robust hard box and are gently protected with shaped-cut foam to protect them perfectly. Kingston has not let any details out while manufacturing this model. The Kingston HyperX Cloud II bass is fun and energetic with very good punch and deep sub-bass. You can use them for your gaming or music listening sessions without bass shortages or thin and anemic sound. Applying an EQ, mid-bass gains some extra punch and sub-bass gets highly empowered reaching depth levels that were unimaginable before equalizing. We put the Kingston HyperX Cloud II through our standardized extreme bass / basshead tests and they handled up to 30% of the maximum power of a Fiio E12 Mont Blanc while being set to high gain, bass boost turned on and applying a customized basshead EQ. The results were a huge increment of mid-bass punch and sub-bass depth that reached a subtle basshead rumble and impact, that was very far from what the Beats Solo2 achieved. At the beginning of the tests the Kingston HyperX Cloud II seemed to had a possibly very high maximum power handling but by getting just slightly above 30% of Fiio E12’s power the right driver crackled, almost blowing up – consider that our tests push the headphones to their limits. The Kingston HyperX Cloud II mids have sufficiently clear lower mids and male vocals; overall they are warm and higher mids offer a crisp but not too harsh personality. If you base your judgement only by their technical frequency response measurements for the mids range you could say that they are almost immaculate but most refined listeners could prefer a little more emphasized lower male vocals. If wanting to apply an EQ for the HyperX Cloud II, it has to be applied accurately or you will highly degrade their mids and introduce boxy vocals or harsh peaks. If done carefully and applying a subtle dB increment in the 400Hz to 1200Hz and a firm reduction in the +/- 3000Hz frequencies, their vocals will sound clearer and overall fresher and much less sibilant but remember that a minimal overemphasized or under-emphasized EQ mistake will make them sound very off. The Kingston HyperX Cloud II highs are bright and provide some detail. Their high’s overall style is not dark nor recessed but neither is too fatiguing – be aware that piercing highs and sibilance is present. An EQ aimed to reduce sibilance and piercing peaks can be applied and they will respond impeccably with a clear reduction of both. At the same time you can mix the EQ with a boost aimed for the upper range of their highs. Combining both EQs may require user’s to be comfortable managing equalization but if you do (and do it right) this Kingston gaming headset will answer back with a jaw dropping increment of brightness and detail while also strongly reducing their fatiguing peaks. The Kingston HyperX Cloud II include a 7.1 virtual surround USB card with a built-in DSP (Kingston calls it Advanced Audio Control Box). This module can be connected to your device (with a compatible USB port) on one side and connect the headphone to the module itself, this will make that the sound being reproduced by the Kingston HyperX Cloud II will be processed by the DSP of the soundcard inside the module instead of coming straight from the soundcard of your device. Our measurements revealed a slight increment of 2dB of total volume output while being connected through the Advanced Audio Control Box. The Kingston HyperX Cloud II are headphones designed as gaming headsets and the 7.1 surround function is also a feature intended for enhancing your gaming experience. Activating the 7.1 surround function there is a clear difference in sound perception with spatial sound; for gaming, the effect gives a much nearer to real life sound experience. If tested for music listening, the effect of the virtual 7.1 surround function can be fun with certain tracks and very weird sounding and off with other songs; it is a hit or miss game. Some instruments and vocals will be picked up and enhanced while others will get sent to the back. As said, this is a function designed for gaming and was not created by Kingston for music listening sessions, therefore it cannot be judged for their weird effect for music listening sessions. The summary of this section is that, for gamers and their gaming sessions, the 7.1 surround function and DSP of the soundcard inside the Advanced Audio Control Box will offer space awareness, better perception of dimensions and sound localization that give a strong advantage to players on FPS games. The sound leaking out of the Kingston HyperX Cloud II is decidedly subdued and it is lower than on many average over-ear headphones. They are not absolutely silent if you crank up the volume to the max or to very high levels but will provide a very acceptable degree of leakage under most usual levels. The sound isolation is clearly noticeable and will partially isolate you from your surroundings. They do not offer the strongest isolation that your money can buy, though; if you want to reach an abolute isolation you might need to recur to above-moderate volumes – depending on how noisy your environment is. The large earcups with memory foam and leatherette (also the velour ones) provide a full over-ear fit and outstanding comfort. Moreover, the headband also makes use of leatherette and memory foam, adding up to their high level of comfort. The earpads can be easily removed and swithched from the leatherette one to the velour (both included for free), according to your needs and preference. The solid aluminum construction gives the Kingston HyperX Cloud II a extremely solid construction that is also able to remain very pleasing thanks to their combination of rubberized coated pieces and leatherette use. Another feature that adds up to the graceful wearing experience is the single-sided, braided and robust cable. The clamping force of the headband is secure and firm but does not compress excessively. Also they are flexible and easily adapt to any head size and shape with their pivoting cups. Despite not being related to comfort or fit, we find important to highlight that with the microphone detached they smoothly look like a high-level music listening headphones with a mixed design of over-sized version of BOSE cups and a Beyerdynamic frame/headband. The Kingston HyperX Cloud II sound can be personalized with advanced custom EQs, they are very responsive but you need to be precise and understand what your are doing or can easily ruin their mids introducing strong boxy vocals. If you do things right they will become crazy bright and detailed, less piercing and sibilant; mids will get clear vocals and bass will gain a strong amount of sub-bass depth. Kingston HyperX Cloud II size and Kingston HyperX Cloud II fit. The Kingston HyperX Cloud II are excellent gaming headphones with plenty of specs, accessories and design features to delight any gamer. 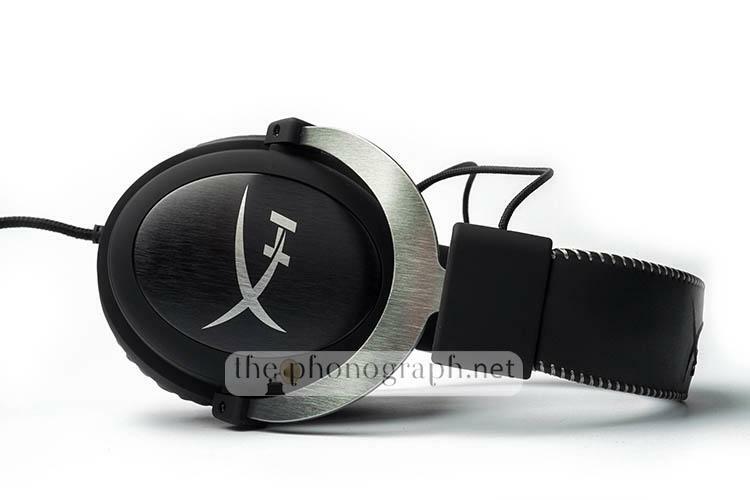 Nonetheless, the brand has intentionally widened the usage possibilities of this HyperX model making them also an absolutely capable headphone for music listening. The overall sound quality of the Kingston HyperX Cloud II is very good and well-balanced with bright and detailed highs, sufficiently clear mids and energetic bass that does not get out of control. The just mentioned, are evaluating them with the same standards as for any headphone designed for music listening and not giving a tender judgement because they are gaming headsets. The Kingston HyperX Cloud II can be safely recommended to gamers that want a solidly constructed over-ear headphone with very good sound quality and who may want to use them for music listening as well. How many drivers does the Kingston HyperX Cloud II have? The Kingston HyperX Cloud II is a single driver headphone. Which means that the Kingston HyperX Cloud II has 1 driver per side. What type of headphone is the Kingston HyperX Cloud II? The Kingston HyperX Cloud II is an over-ear headphone. The Kingston HyperX Cloud II is an open, semi-open or closed back headphone? The Kingston HyperX Cloud II is a closed back headphone. Does the Kingston HyperX Cloud II have a microphone? What is the price of the Kingston HyperX Cloud II? You can check the most up-to-date price of the Kingston HyperX Cloud II by following THIS LINK. Where can I buy the Kingston HyperX Cloud II? Which Kingston HyperX Cloud II colors are available? The colors available for the Kingston HyperX Cloud II are: Kingston HyperX Cloud II Black, Kingston HyperX Cloud II Red, Kingston HyperX Cloud II Pink . What cable do the Kingston HyperX Cloud II have? The Kingston HyperX Cloud II have a single-sided, round cable which is braided. What cable connection does the Kingston HyperX Cloud II have? The Kingston HyperX Cloud II cable connection has a male 3.5mm mini stereo plug . Are there replacement cables for the Kingston HyperX Cloud II ? The Kingston HyperX Cloud II cables cannot be replaced, they have fixed non-replaceable cables. Are there upgrade cables for the Kingston HyperX Cloud II ? The Kingston HyperX Cloud II have fixed-cables, so you cannot get upgraded cables but you can buy 3.5 mm extension cables with any additional accessory. Does the Kingston HyperX Cloud II have Bluetooth / The Kingston HyperX Cloud II is a wireless headphone? The Kingston HyperX Cloud II is a wired gaming headset that does not have Bluetooth but you can buy Bluetooth adapters to make them Bluetooth-enabled headphones. Is the Kingston HyperX Cloud II compatible with Apple devices? The Kingston HyperX Cloud II is fully compatible with Apple devices. Is the Kingston HyperX Cloud II compatible with Android smartphones ? The Kingston HyperX Cloud II is fully compatible with Android devices. Is the Kingston HyperX Cloud II compatible with Xbox , PS4 , Wii, PC, Mac ? The Kingston HyperX Cloud II is compatible with all gaming platforms including PC , PS4, Wii , Mac and is also Xbox licensed. Can I use the Kingston HyperX Cloud II with TeamSpeak, DISCORD, Skype, Ventrilo, Mumble and RaidCall? The Kingston HyperX Cloud II is fully compatible with TeamSpeak, DISCORD, Skype, Ventrilo, Mumble and RaidCall. Even more, the Kingston HyperX Cloud II is TeamSpeak certified and DISCORD certified.